submerged the falafel balls completely in hot oil when frying (as opposed to frying them in a shallow pool of oil, then flipping them). I also discovered that the addition of vegenaise to the usual tahini dressing mixture of fresh lemon juice, tahini, pepper and a splash of water, gives it a richness that complements the falafel perfectly! Place the chickpeas into a food processor and grind into a coarse mixture, ensuring that all chickpeas are pulverized, but also ensuring that it is not overprocessed into a smooth mixture. Transfer to a bowl. Place the rest of the falafel ingredients into a food processor and blend until the mixture is cohesive. Transfer that to the bowl with the pulverized chickpeas and stir to combine. Place in the refrigerator for at least 4 hours prior to frying. Make your tahini dressing by whisking the tahini, lemon juice, vegenaise and water in a small bowl. Refrigerate until you are ready to use it. Once you are ready to make the falafel, pour plenty of oil into a small saucepan (enough to cover the size of the falafel) over high heat. While you are waiting for the oil to heat, scoop out a small amount of the falafel mixture—enough to make a golf-sized ball and repeat until all of the falafel has been used. Your oil should be ready by now. Test it by throwing a pinch of the batter into the oil. If it sizzles immediately, its ready. Using a slotted spoon, carefully submerge the falafel into the oil one by one. Do not overcrowd the falafel in the pan. Once you drop the falafel into the oil, wait about 7 seconds, then insert the spoon under the falafel and gently lift it to ensure it doesn’t stick to the bottom of the pan. Drain the falafel on paper towels as you finish each batch. 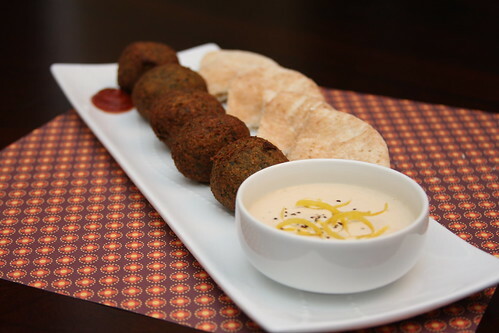 Serve the falafel with pita bread, tahini dressing, black olives, bulghur tabouli and hummus. Sriracha goes well with the falafel and tahini sauce. those look so delicious! i want to dry them with a gluten free flour to see how they do. my favorite lebanese place here makes delicious falafel that happen to be xgfx! so yummy. kittee, I would be interested to know how these turn out with a gf flour … let me know! Now I am craving falafel like crazy! How perfect do those look?! Your photography is amazing!!!! I've read a recipe that says to store the flour overnight. What's the reason for this? Thanks for your comment. I think that when frying, its best to keep all of the components as cold as possible when frying — it helps repel the oil better than something at room temp or warmer. But this is just a theory.